Mama always has the best breakfast, she knows just how you like your eggs, and she always remembers to add that special ingredient into every bite. But if you want a special breakfast the way Mama makes it, you don’t have to make the trip all the way back home. The Recipe Box Family Diner is right here in Brandon, and Manny and Todd are cooking up breakfast meals “Just like Mama used to make.”Manny Nikias and Todd Siegal are long time friends that first met in elementary school in New York. After working together in a few other restaurants and cooking at home with their own families, the two friends began collecting all the best recipes they had stowed away in their kitchen drawers. 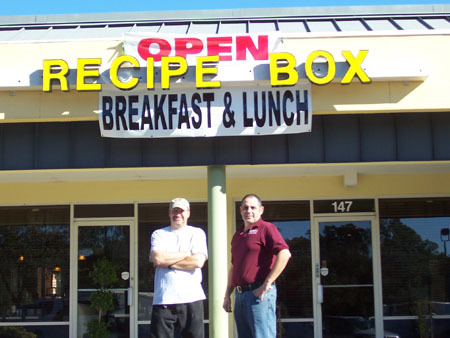 From Belgian Waffles to their own Recipe Box Burgers, they put all their best recipes together to form the menu, and on December 14 2009, these two lifelong friends opened Recipe Box Family Diner in the WinnDixie shopping center on John Moore Rd. and Bloomingdale Ave.A meal that is fit for anyone that walks through the diner door is Mama’s Breakfast, with eggs cooked any way you like, bacon or sausage served sizzling hot and big thick pancakes delivered to your table just as hot as the bacon. You’ll definitely get your moneys worth when you order this tasty meal and you’ll leave the Recipe Box with a belly full to the brim. And the service is just as wonderful as the meals. Manny says, “We’ll have better service than a typical breakfast diner. We want to deal directly with customers right as they’re walking through the door.” That was the exact type of service this reporter received from the staff. A lifetime of recipes, a lifetime of memories; Recipe Box Family Diner is a great way to start your day, or to meet an old friend or breakfast or lunch. For a tasty meal or for more information, you can stop by the diner at 147 E. Bloomingdale Ave. in Brandon, or check them out and order online at www.recipeboxdiner.com. Caption: Todd Siegal (left) and Manny Nikias (right) friends since Elementary school open up Recipe Box Family Diner in the Winn Dixie Plaza off Bloomingdale Ave. and John Moore Rd.